Why does my prescription not include the PD? Home » What's New » Why does my prescription not include the PD? Many patient’s looking to purchase eyeglasses online, expect to have the PD when they receive their prescription. Some offices will put the PD measured by some of the instrumentation during your exam on the prescription and others will have the optician take that measurement for you. The doctor during your exam does not take your PD at anytime during your exam, as that is left to the optician who is going to make your eyewear. Having an inaccurate PD will not harm you, but may make your vision uncomfortable, strained and in the worse case scenario, cause double vision. 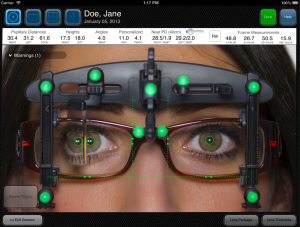 The most accurate way to measure the optical center of your glasses is with the frame on. For most patients this usually does not cause a problem, but those who are sensitive to prescription changes and/or have stronger prescriptions will have issues. A professional optician, like a carpenter making a cabinet, would never rely on someone else to take those measurements. When it comes to bifocals and progressive lenses, a segment height is needed and would be almost impossible to get accurately without the patient in front of you with the glasses on. Your optician may or may not charge for these measurements, but remember when you are in need of professional services such as adjustments and advice, that your optician would not be there to preform these services if other customers were not purchasing from them. Some online companies have attached a monetary value to these services. Warby Parker for example will refund up to $50 for these services, because they know it is important to the overall satisfaction with your eyewear. Here at North Country Eye Care, we offer a optical service plan that covers your measurements, adjustments, verification and consultation.